Psychologists trained in the art of lie detection sometimes describe a phenomenon called “duping delight”—an intense, often uncontrollable thrill that people experience when they’re in the midst of a lie and getting away with it. Often “duping delight” manifests itself in a nervous laugh or a fleeting smile that seems inappropriate to the context or the situation. 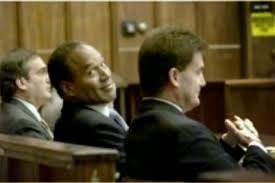 The term was coined by Dr. Paul Eckman as a way of explaining the half-suppressed grins and other “micro-expressions of pleasure" he noted on people’s faces when they're trying to manipulate other people with lies. Duping delight, he suggested, is the “pleasure we get over having someone else in our control and being able to manipulate them.” Subsequent psychologists have connected it to the natural thrill humans experience when they exercise power. Deception delights us, in particular, because it stimulates the neurological reward systems that are activated whenever we believe we have something that others do not have. In other words, we are hard-wired to find a deep-down, often uncontrollable delight in secrecy, deception, and truth-hiding, because these things—the art of the dupe—make us feel powerful, knowing we know something that others do not. 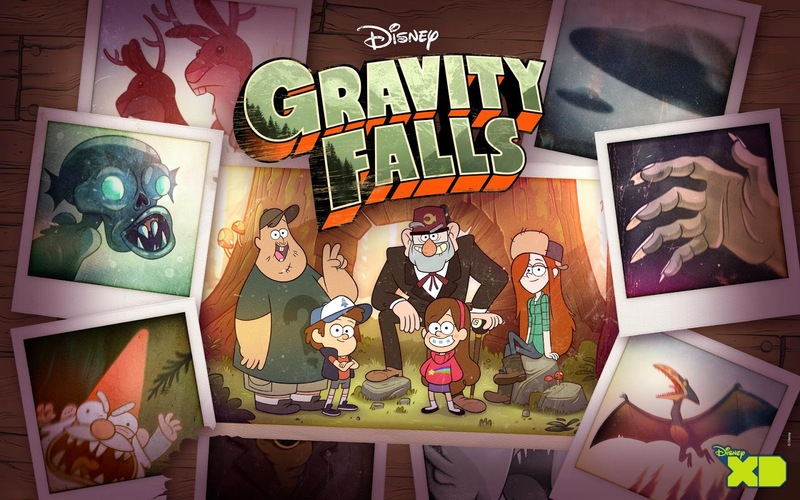 “Duping delight” is a helpful concept as we continue this month’s theological analysis of Gravity Falls, the popular new animated series by Disney that’s a pretty big hit at my house. To the extent that Dr. Eckman was on to something there, it helps us get at one of the unique aspects of the show, something that has contributed both to its popularity and to the endless speculation swirling around it on the internet (and not a few conspiracy theories, too). I’m talking here about its use of the dupe. Even a casual viewer of Gravity Falls—like, say, a father trying to keep up on the interests of three adolescent fans—will notice that it majors in deceptions, mysteries, and secrets of all kinds. There’s the surface, of course: Grunkle Stan is a self-admitted con-artist running a phony “museum of the paranormal,” with the express intent of bilking tourists out of their hard-earned vacation dollars. A number of the early episodes, in fact, lean heavily on this plot-device. Stan’s arch-enemy is a phony child-psychic named L’il Gideon, himself a conman who uses fake psychic powers for his own bilking enterprises. The dramatic finale of Season 1 leaned heavily on this plot-device. Then, of course, there’s the mysterious, anonymously-penned journal (itself a riddle wrapped in an enigma) which reveals the hidden truths behind the deceptive “everyday” of Gravity Falls (nearly every episode leans on this one). So that’s the surface. But, as with all things Gravity Falls, there’s also the beneath-the-surface. 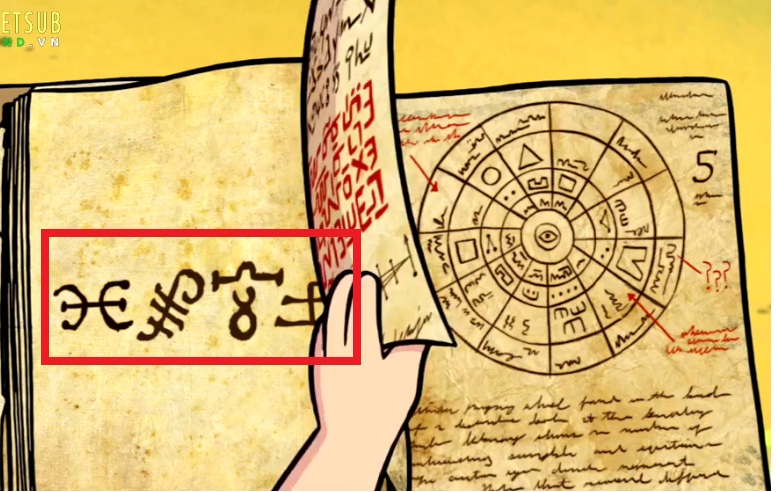 Peppered throughout the show are all sorts of mysterious ciphers, strange riddles and pseudo-cultic symbols. Dipper’s journal itself is scrawled with them, as are the paranormal paraphernalia in the Mystery Shack. 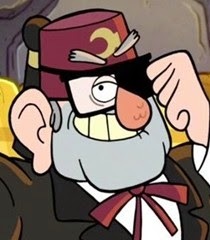 Grunkle Stan sports an unexplained fez that's reminiscent of Masonic headgear. 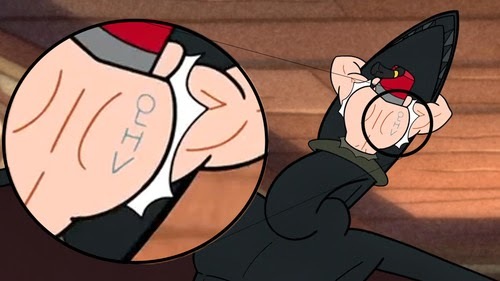 The main villain in Gravity Falls is a disturbing demon named “Bill Cipher,” who bears an uncanny resemblance to the “All-Seeing-Eye” on the American dollar bill (yeah, the one that conspiracy theorists believe is a Masonic insignia). Similar “triangle-framed-eyes” appear all over the place in the show’s background. So that’s the beneath-the-surface; but there’s an even deeper layer here. Every show, for instance, is littered with bizarre cryptograms and hidden messages, which only the most attentive viewers notice (see here for a list). The opening credits always end with a backward message whispered breathlessly, which, if you've got the time and the interest to play it the right way 'round, gives away a clue about one of the characters. And the closing credits, too, always show a cipher at the very end, which, if you enjoy that sort of thing, you can decode to learn something about an upcoming episode. And then, of course, there’s this arcane-looking picture that flashes briefly at the start and end of every episode, and has generated more conspiracy theories online than chem-trails or water-fluoridisation combined. On the one hand, it’s all this enigmatic symbolism that’s made some Christians skeptical about the show (see Part I of this series on that), but it’s also what’s made it especially popular. The fun’s not just in the goofy gags and the interesting stories; it’s in all the deciphering and decrypting and detecting that carries on after each episode’s done. The “delight” of Gravity Falls is, in fact, a kind of duping delight—the pleasure of knowing a hidden truth that others don’t because you were able to decode riddles that others weren't. The word “occult,” of course, is so loaded with images of goat heads and spiritual evil that it’s hard to use it here without giving the wrong impression, but to the extent that the word simply comes from the Latin word occultus, meaning “hidden, or secret,” and to the extent that it literally just means “knowledge of the hidden,” we might suggest that it aptly describes the appeal of Gravity Falls. The truest fans of the show—the ones who take the time to crack the codes and unscramble the letters—are rewarded—“delightfully” rewarded, you might say—with an insider’s knowledge of the hidden. Gravity Falls, it turns out, appeals to the all-too-human pleasure we derive from knowing a hidden truth. 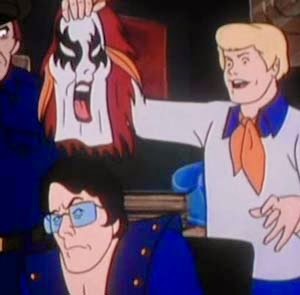 And, whether Stan’s Masonic headgear is anything more than a tongue-in-cheek gag, I suspect this is also the appeal of secret societies like the Masons, and conspiracy theories of all kinds, and the Occult of the worst kind—the supposed power that comes from having an insider’s knowledge of the hidden. If this is making sense, then let me draw some theological lines between all this mystery, and the Christian Faith. Because whatever else they believed about Jesus, the earliest Christians believed that in encountering him, they had come into contact with a mystery that had been hidden from the creation of the world. Here’s a smattering of their writings on the subject: “[I want you to know] the Word of God, the mystery that has been kept hidden for ages and generations, but is now disclosed to the saints” (Col 1:26); or “[God’s intent was to] make plain to everyone the administration of the mystery which for ages past was kept hidden in God” (Eph 3:9); or “We declare God’s wisdom, a mystery that has been hidden [since] before time began” (1 Cor 2:7). And don’t get me started on the Book of Revelation, an apocalyptic vision that’s all about the hidden spiritual realities going on behind the veil of the everyday. Like Gravity Falls, the Gospel, too, appeals to the all-too-human pleasure we derive from knowing a hidden truth, but with one big difference. And it’s a difference that makes all the difference. Because unlike the kind of mystery that is the purvey of a show like Gravity Falls (or more importantly, the purvey of those darker things that Gravity Falls draws on superficially for its symbolism—secret societies and conspiracy theories and weird occult gobble-de-gook) the Gospel is not a mystery to be uncovered. The Gospel is a mystery that has been revealed. This is woven right down into the fabric of the New Testament, and is altogether different from “occult” mysteries, so called (however we define that word): The Gospel is the Truth about Life that was once hidden, kept secret, but now, in Christ, is revealed to all, disclosed to all, and available to all. In Jesus, God went public with the mystery of his intentions for the world. This actually takes us right to heart of one of the very first heresies the Church faced. It was called Gnosticism (from the Greek word, gnosis, meaning "knowledge"), and it specialized in "secret knowledge" about god, mysteries that only the initiated knew, and the outsider, especially, didn't. In Gnosticism of all forms, it was this secret knowledge that saved. Salvation itself was a mere matter of knowing and keeping secrets, and in the worst forms of Gnosticism, this "secret knowledge" devolved into the most convoluted, obscure and bizarre obfuscations imaginable. A theologian named St. Irenaeus (ca. 200 AD) wrote one of the first and most decisive refutations of Gnosticism ever, and the title of his book sort of says it all: On the Detection and Overthrow of 'Knowledge,' Falsely So-called. Gravity Falls is not the worst form of Gnosticism, of course, but neither is it the only cultural phenomena these days that draws heavily on the delight—and the subtle feelings of power—we derive from believing we're on the inside of a secret. From Harry Potter to "Paul is Dead" from Anonymous to Wiki-leaks, the list is long and varied. Any theological analysis of Gravity Falls, then, would be remiss if it didn't at least point it out, how the Christian message both speaks to the power of the secret, but also disarms it. Because the earliest Christians recognized how easily "spiritual secrets" can manipulate and ensnare and exploit the human heart; and more importantly, they believed that in Jesus, they had encountered a God who had gone scandalously public with his love for this hurting world—and because of these things, they kept insisting that the mystery of the Gospel was, in fact, an open secret, offered to any and all who had ears to hear it and a heart to receive it. Is it okay for Christians to do yoga? Is there a right or wrong way to pray? What about drinking alcohol? Or getting tattoos? While these questions may seem somewhat random, they are the kind of down-to-earth questions that Christians face all the time as they try to follow Jesus in the real world. Now: any Christian worth his or her salt would agree that the answers to questions like these must be found in the Bible, which is the final authority on what we must believe and how we must live. The only problem is, it’s seldom so easy as simply saying, “For the Bible tells me so.” Sometimes the Bible may not address the question directly. It was written 2000 years ago, after all, so it doesn’t directly address modern ethical questions like invetro-fertilization, let’s say, or the place an ipod ought to have in our lives. Even when the Bible does directly address an issue, its teaching still needs to be interpreted by flesh-and-blood humans like us. And, as the 2000 year history of the Church has demonstrated, often very well-meaning Christians can arrive at very different interpretations of the same passages. An eighteenth century theologian named John Wesley recognized this challenge. In his writings, he tended to emphasize three things alongside the Bible—tradition, experience, and reason—which help us interpret the Word of God and apply it to our lives. Wesley was the founder of a Christian movement called “Methodism.” Following his example, Methodists often refer to the “Wesleyan Quadrilateral” as a framework for tackling the tough Faith Questions. As the name suggests, the “Wesleyan Quadrilateral” has four corners, four “sources of knowing” that we use in arriving at answers for how we should live and what we should believe. Again, these are: The Bible—what does God’s Word say on the matter; Christian tradition—how have Bible-believing Christians consistently answered this question? Reason—what answer does logic and evidence point to? And experience—what “rings true” for us based on our experience in the real world? Most Christians intuitively use tradition, reason and experience together when interpreting the Bible without even realizing they’re doing it. The Wesleyan Quadrilateral just tries to make this more consistent and transparent as an approach to the Bible. If we come across a teaching that looks good on the surface but radically re-writes 2000 years of Christian tradition, let’s say, or is jarringly out of synch with our experience of God or the world, or is just plain irrational, then it doesn’t pass the smell test. The Wesleyan Quadrilateral is a helpful concept, but it’s important to remember that this is not a simple symmetrical square. The Bible is always the first and ultimate authority, and tradition, experience and reason are always secondary sources. This quadrilateral, in other words, is decidedly lopsided. Think about it like a three-legged stool. The seat, obviously, is the most important part, but it needs legs if you’re gonna sit on it. At the same time, the stool’s only stable if all three legs are in place. None of the legs, on its own, can hold up the seat. In this analogy, the Bible is the seat on which we rest, and the legs are tradition, reason and experience, which all need to be in place for us to arrive at a solid interpretation. Perhaps an even better metaphor is found in a pair of glasses. For a Christian, the Bible is the lens through which we view the world; but we can’t wear the lenses unless they’re set in frames, resting securely on our noses and held in place by our ears. In this analogy, the lenses are the Scriptures, the frames that hold them in place is tradition, the nose represents our reason and the ears represent our experience. There's a spot in 2 Kings that gets me thinking about the mysterious ways that God is able to use us for his purposes, in spite of our worst spiritual failures. 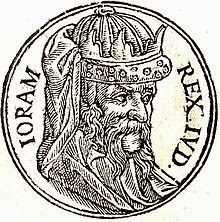 In 2 Kings 14:23-24, it says that a king named Jeroboam came to the throne in Israel, and he as bad as any King they've ever had (in v.24 we read the familiar refrain: "he did evil in the sight of the Lord"). So you might be ready to write this guy off, but then in verse 27, it says that YHWH saw the sufferings of his people (presumably from the military aggression of the surrounding nations), and he saw how bitter it was for them, so he saved them by the hand of Jeroboam. This is fascinating, and, I think, good news. As big a spiritual failure as he was, the Lord was still able to work deliverance for his people through King Jeroboam. And when you ask why and how, verse 27 gives the answer very clearly. It had nothing to do with Jeroboam himself and everything to do with YHWH's faithfulness: he had promised never to blot out the name of Israel from under heaven, and he was committed to his word, whatever it took. I find this encouraging, because, truth be told, I'm no spiritual super-star, either, and I'm not sure but if I were on the throne in Jeroboam's day, my reign would probably have gotten the familiar disclaimer of verse 24, too. And yet, God's purposes for us transcend our sin; to augment the U2 song only slightly, "His grace makes beauty out of ugly things." May God grant us the grace simply to rest in that knowledge. A View of the World from Gravity Falls, Part II: Re-Enchanted Worldview, Where are You? Last week I started a new series here at terra incognita, intending to give a cultural and/or theological analysis of Gravity Falls, an animated Disney series about the mysterious and the unexplained that my kids really like. The idea for this series came to me when I started noticing some curious parallels between Gravity Falls, and that other cartoon about the mysterious and unexplained-the one you grew up with. I’m talking, of course, about Scooby Doo. Just in case you didn’t grow up with it, let me set the scene. Scooby Doo was an animated series by Hanna-Barbera that originally ran from 1969-1975, with a number of spin-off and follow-up series from '76-'91, and reruns and revivals right up to the present day. 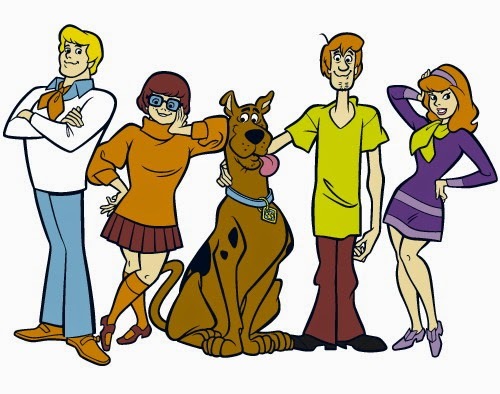 The show followed the mystery-solving misadventures of four teenagers—Fred, Daphne, Velma and Shaggy—along with their talking Great Dane, Scooby Doo. They drove around in a green van, The Mystery Machine, exposing paranormal activity and solving crimes. Every episode followed the same basic plot. The teens stumble across some mystery or other that involves a spooky legend or a supernatural creature, mostly ghosts, vampires, werewolves and the like. With some careful sleuthing and a few zoinks!-inducing monster-chases, they inevitably discover that the particular paranormal oddity of the week is really just an elaborate hoax, concocted by a local criminal using the ghost-story to cover up his crimes. If this little stroll down amnesia lane has triggered any memories for you, let me draw some lines between Scooby Doo then and Gravity Falls now. There are, of course the obvious parallels. Both Scooby Doo and Gravity Falls is about four young people sleuthing their way to the bottom of a bunch of paranormal mysteries. In Scooby Doo they use the Mystery Machine as their base of operations; in Gravity Falls it’s the Mystery Shack, but mystery-solving is the order of the day in both. Then there are the more subtle parallels. In Scooby-Doo, comic relief was provided especially by Shaggy, a bungling man-boy with a voracious appetite and a scruffy goatee, who used 1960s teenage slang like “man” and “like.” In Gravity Falls it’s Soos, a bungling man-boy with a voracious appetite and a scruffy goatee, who uses slang like “dudes” and “totally.” In Scooby Doo, Daphne was an attractive, red-headed teen, the love interest for Fred (we all assumed, though this was never made explicit); in Gravity Falls, it’s Wendy, an attractive red-head who works at the Mystery Shack and is quite clearly Dipper’s crush. Velma was the brainiac in Scooby Doo, the one who usually got them to the bottom of every mystery; in Gravity Falls, this role is taken up by Dipper. These coincidences may all be just that—a coincidence—or it may be that the makers of Gravity Falls were as influenced by Scooby Doo’s antics as I was growing up. There is, of course, no anthropomorphic dog to parallel Scooby Doo himself, but then, Mabel does have her pet pig Waddles, who achieves a similar comic effect. I’ll leave more seasoned fans of either show to speculate about these similarities. What I’m more interested in today—what gets us, actually, closer to the theological meaning of Gravity Falls as a cultural phenomenon—is their differences. Theologians have a name for this way of looking at the world—the skeptical assumption that every paranormal odditiy has an altogether normal explanation, that we’ll get to if we’ll just follow the evidence with enough determination not to be taken in. They sometimes call it a “disenchanted worldview.” “Worldview,” because it’s a way of viewing the world. “Disenchanted,” because it has rationally explained away—unmasked, as it were—things that in earlier eras or other cultures we’d chalk up to enchantment: spirits, ghosts, demons, magic, the supernatural. In a fascinating blog post on the Scooby Doo cartoons, psychologist Richard Beck interprets the show as a parable for the disenchanted world view of our modern world. 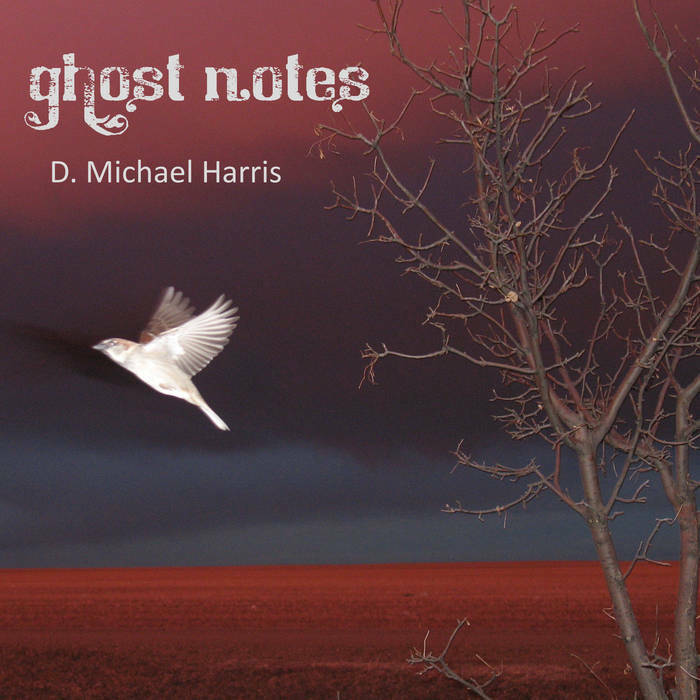 In his words: “The episodes begin with enchantment, with a supernatural monster ... But as the kids investigate they get suspicious, reason asserts itself and the monster--the agent of the occult--is eventually revealed to be Mr. Jenkins the greedy banker. The story ends with disenchantment. The supernatural was simply a ‘cover’ for workaday greed, theft and corruption"
If Richard Beck’s on to anything, then you can’t help but notice that some 40 years after Scooby Doo, Gravity Falls has radically reversed the narrative. The story line of every Gravity Falls episode involves Dipper and his friends tracking down a very real supernatural entity, something or other in the woods that the older generation (those raised on Scooby Doo, presumably) have dismissed as an urban legend, explained away as irrational, or just plain don't know about. Armed with his enigmatic journal (written by who-knows-who?) and a determination not to be taken in by mere reason, Dipper is able to unmask the supernatural mysteries lurking beneath and behind the everyday, using everyday reason as a guide. In short: if Scooby Doo was about the disenchantment of the world, Gravity Falls is about the world’s re-enchantment. The heroes of Gravity Falls explain the supernatural, but they don’t explain it away. Social theorists tell us that we live in something called the post-modern era, a western cultural epoch where people are less and less satisfied with the logic and reason that characterized the modern era, and are increasingly open to things like mystery, wonder and spirituality. If this is true, we might hold a popular Disney Show like Gravity Falls up against a 1969 classic like Scooby Doo, as ground-level evidence. Could that be a deep-down longing for re-enchantment that we’re actually hearing, in all those accolades to Gravity Falls floating around on internet? 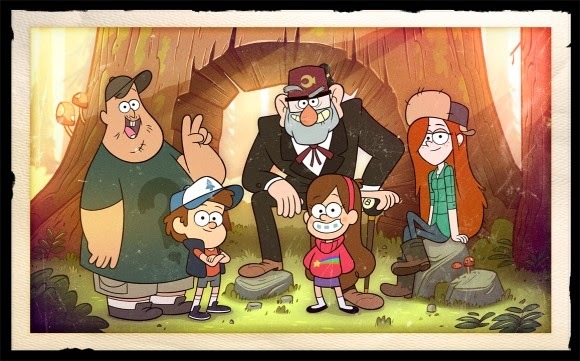 Could the popularity of Gravity Falls really be voicing our culture’s profound dissatisfaction with the disenchanted worldview of the modern era? Maybe, maybe not. But if it is—even if it might be—then this might be a good place to point it out, that whatever else is true about a Christian Worldview, it is an enchanted worldview, in the very best sense of that term. Christians believe that the Creator has been, and is now at work in the world in ways that are invisible, mysterious, miraculous, and not necessarily beholden the rules of systematic logic as we perceive them; he makes his angels spirits and his ministers flames of fire; the heavens declare in every speech the glory of the Lord. There is more going on in heaven and earth than is dreamed of in your philosophy, Shaggy. We’d probably have different things to say than the makers of Gravity Falls about how and why this is so, but in this one thing, I think, we’d agree: our contemporary Western worldview would’t suffer from a little re-enchantment, after all; and a little healthy skepticism about our all-too-rational skepticism is probably as good a place as any to start. When I was about 14, I started drinking 7-Up for no apparent reason, even though deep down inside I hated the taste of it. I couldn’t say why I’d made the switch until one day I happened to be standing in front of a convenience store cooler and suddenly it dawned on me. I’d been sucked in by the ads. Earlier that year, 7-Up had run a series of TV ads that featured a good-looking guy driving around in a cool green convertible. The storyline of every spot involved the guy winning the attention and the admiration of a stunningly beautiful young woman, and then drinking a cool, refreshing can of 7-Up in the closing frames. In retrospect, the message is kind of obvious: men who drink 7-Up are irresistible to the ladies; and to a 14-year-old-boy right at the outset of puberty, this message was itself irresistible. So I started drinking 7-Up. “Semiotics” is the study of how signs—images and symbols and so on—mean things. It’s the “science of signification” and it’s very important in advertizing. Because, as the creative minds behind the 1980s 7-Up ads would tell you, commercials don’t induce us to change our shopping habits simply by pointing to the produce itself. The “sign”—in this case the commercial—actually points to deep down, psychological needs or desires—in this case the desire to be sexually attractive. That desire is the ad’s “referent,” and this “referent” points us back through the “sign” to the ad’s “message”: drink 7-Up. The Bible, of course, is unlike television commercials in almost every way, except this: as a sign, it too has a semiotic referent and a message. Because Christians believe that the Bible is the inspired word of God, and it is; but the Bible itself actually says that Jesus Christ is the Word of God. In John 1, for instance, it says “in the beginning was the Word and the Word became flesh and dwelt among us.” The word in Greek there is logos, and the point is: Jesus is the logos, the living Word of God, God’s message of love to us. Of course, we also have the written Word of God—the literal words on the page of the Bible. Often when the Bible wants to refer to the written Word, it will use the Greek word graphe, which means “the Writings” or “the Scriptures.” And the thing is, the written word—the Bible—is the Word of God because it points us to Jesus, the Living Word of God; and the best way to encounter Jesus, as God’s Living Word, is by meeting him in the written word. But there’s a third layer to this; because the Bible also speaks to us directly about our actions and attitudes, and how they ought to look as followers of Jesus. This is the Word of God spoken to us directly, as God’s Spirit applies the Bible’s message to our lives. Often when the Bible is talking about the Word of God on this third level, it uses the Greek word rhema, which means “the utterance” or “spoken word” of God. Theologians sometimes call this a “Christocentric” reading of the Bible—one that keeps Christ at the centre—and it’s essential if we want to read the Bible for all its worth. Because reading the text without keeping Jesus as the referent can lead us into lifeless literalism, and reading it without applying the message to our lives can lead us into lifeless abstraction. But when we let its referent—Jesus Christ—point us to its message, that’s when God’s Word will become for us what the Bible says it is: a lamp for our feet and a light for our path. There's a story in 2 Kings 13:21-25 that gets me thinking about the life-giving power of God's Word. In a nutshell: some Israelites are burying someone, when they see a band of Moabite raiders coming. In fear they hide the body in Elisha's tomb, the Prophet of God who had died only few years (and a couple of verses) earlier. When the body touches Elisha's bones, it says, the man comes to life and stands up again on his feet. During his life, of course, Elisha was the representative of the God's Word, guarding it, preserving it, speaking it's truth to power; and even now in death, the prophet-- the locus of God's Word-- is still working wonders. There are probably a number of directions we could go with this, but it gets me thinking, like I say, about the miraculous power that God's Word still has, today, to bring things to life. I've seen it. However dead and dusty this old book may seem-- however much like old bones lying silent in an ancient sepulchre it may feel in our modern hands-- it is still able to work life-giving, life-changing miracles in us and among us. Even the slightest brush with it, it would seem, has the power to bring dead things to life and set them on their feet. When I was a kid, one of my aunts had an antique stereoscope in her living room. The stereoscope was sort of a 19th Century version of the 3-D TV. They came with a collection of black and white photographs that looked three dimensional when you viewed them through the viewer. Each photograph had the same image printed on it twice, and the stereoscope played with the depth perception of your eyes, making the two images fuse together into a single, 3-dimmensional scene. If you only looked through one lens, the picture was flat and two dimensional, but when you looked through both lenses at the same time, it took on 3 dimensional depth and life. The Bible is like this, in some ways. There’s a place in the New Testament where it says that the Scriptures are “God-breathed”—that they were spoken by God. Theologians sometimes use the term “Inspiration” to talk about this, the idea that God himself “breathed-out” the words of the Bible; and Christians believe quite strongly that the Bible is the Inspired Word of God—that when we read it, we’re actually hearing from God himself. But how should we understand this? 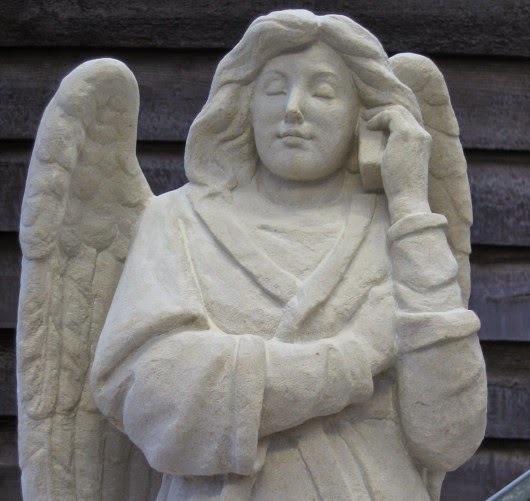 Some people approach the Bible as though it were literally dictated by God, that the humans who wrote it were just recording word-for-word what they heard God say, as clearly as if he were speaking to them on the phone. Others dismiss the idea of divine inspiration altogether, and feel the Bible’s just a human record of people’s ideas about God. An interesting book, but not anything God wrote. Both of these approaches—seeing the Bible as simply a human creation, or seeing the Bible as something dictated word-for-word by God—are kind of like looking at a stereoscope through only one lens. The picture is going to be flat. If we really want the Bible to come to life, we need to view it through both lenses at once: it’s a human book, that people wrote and edited and crafted, and, at the same time, it’s a divine book, that God spoke, and shaped and inspired. Maybe a musical analogy will help. Different musical instruments have different tonal qualities and character, depending on the material they’re made of and how the notes are sounded. A trumpet is bright and explosive. A clarinet is breathy and earthy. A kazoo is nasally and playful. The same musician could breathe into each of those instruments, and her breath would produce three very distinct sounds. She could play the exact same song on all three instruments, the very same notes, and no matter how good she is, the clarinet won’t ever sound like a trumpet and the kazoo will never sound like a clarinet. Because the authors who wrote the various books of the Bible had each encountered God in a unique, unrepeatable way; and then, while God’s Spirit was working in their hearts, they recorded what it was God was saying to them through that encounter. 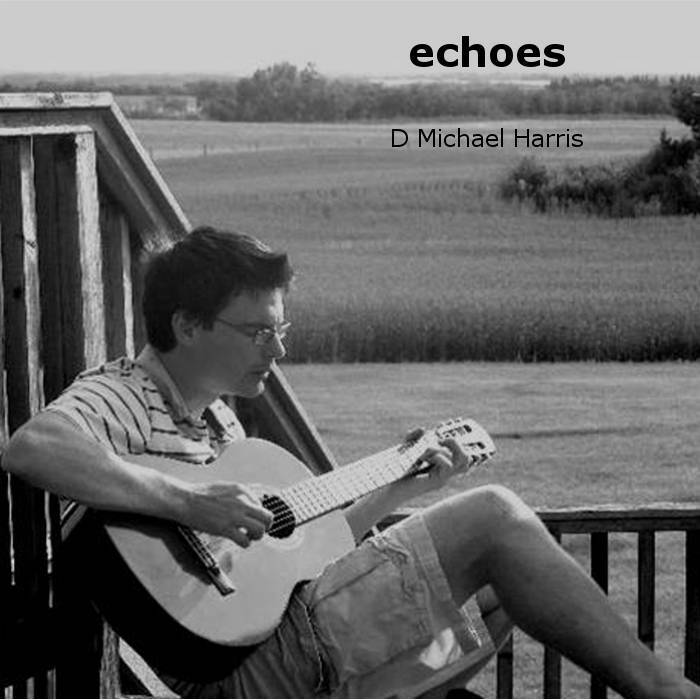 Like a musician picking up an instrument, God’s Spirit was “breathing through them,” determining the song that came out. But at the same time, they were writing as people, with individual personalities and perspectives and passions, all of which determined how they would tell the story, choose the words, record the message. Just like a clarinet doesn’t stop sounding like a clarinet, or a trumpet like a trumpet, just because it’s the same musician playing both, the fact that God was speaking through them doesn’t mean that it wasn’t also them speaking; and even though the words were their words, it’s still God’s Word we’re hearing when we read them. Or, like it says in one place, the Sacred Writings don’t have their origin in human beings, but human beings spoke from God, as they were carried along by the Holy Spirit. There's a very strange story in 2 Kings 13:11-20 that gets me thinking about the ways and the times I "low-ball" my expectations of God. Elisha's on his deathbed and the king of Israel comes for a final visit (Israel is, incidentally, under siege again by the Arameans). So Elisha tells the king to take a bow and arrow and strike the ground with it. It's an altogether bizarre request, but King Jehoash complies. I can only imagine Jehoash's arched, incredulous eyebrow as he tentatively taps the ground with the arrow, watching Elisha skeptically the whole while. I have to imagine it, because, although it's not stated, it's strongly implied that Jehoash's response to Elisha's directive was a half-hearted flop. He only tapped the ground three times instead of five or six, Elisha says, and because of that, he'll only win three battles against Aram, but he won't win the war. I used to think this was a somewhat capricious thing for Elisha to do. 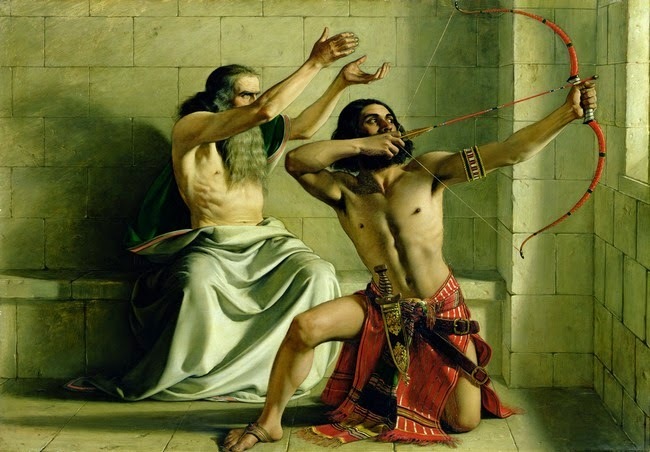 How could Jehoash have known that the fate of his entire country rested on his hitting the ground six times with a bow and arrow rather than only three? But this morning it occurred to me that there is a deeper kind of "half-hearted obedience" going on in Jehoash's life. In 2 Kings 2:11, we're told that he did not lead Israel away from the idolatrous evil that the kings before him had committed. He continued in the sins of his fathers. With that in mind, this is my reading of the arrow-tapping incident: Jehoash has woefully low expectations of YHWH's ability to deliver, prosper, and keep his people at all--period-- and this is evident, not in his feeble response to the arrow-tapping thing-- but in Baalism that he's allowed to continue unchecked in his kingdom (why not keep Baal in your corner, just in case YHWH can't pull through, right?). And the deep spiritual half-heartedness of his life shows up in his superficial half-heartedness with the arrow thing, only "playing along" with Elisha and tapping the ground three times...you know ... to humour YHWH's prophet. And the thing is: God is prepared to live up to the low expectations of his king. Jehoash will win a battle or three, but Aram will win the war. And it leads me to wonder: where, and when, and how I'm like Jehoash. In what areas of my life doI set the bar pitifully low for God, and how are my low expectations of him evident in my half-hearted obedience to him? Because if God can put his finger on that for us, I think that's where we'll start to discover what a whole-hearted life with him might look like. Sitting in the dentist’s chair while your teeth are being cleaned isn’t the best of places to start expounding on the meaning of marriage anyway, but even so, this one caught me a bit off guard. It was a new dental clinic for me—we’d only recently moved to the community—so the dental hygienist and I were just getting to know one another. Mostly, of course, I was getting to know her. 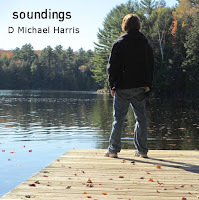 It was, after all, hard for me to do much of the talking, what with that spotlight in my eyes and my tongue pushed back by a dental mirror; but no matter, she was valiantly keeping up enough conversation for the both of us. Between rinses I explained I was a pastor. This intrigued her, and she shared some of her perspectives on the church. “Did I do weddings?” My tongue held back by the dental implements again, I did my best to indicate I did. 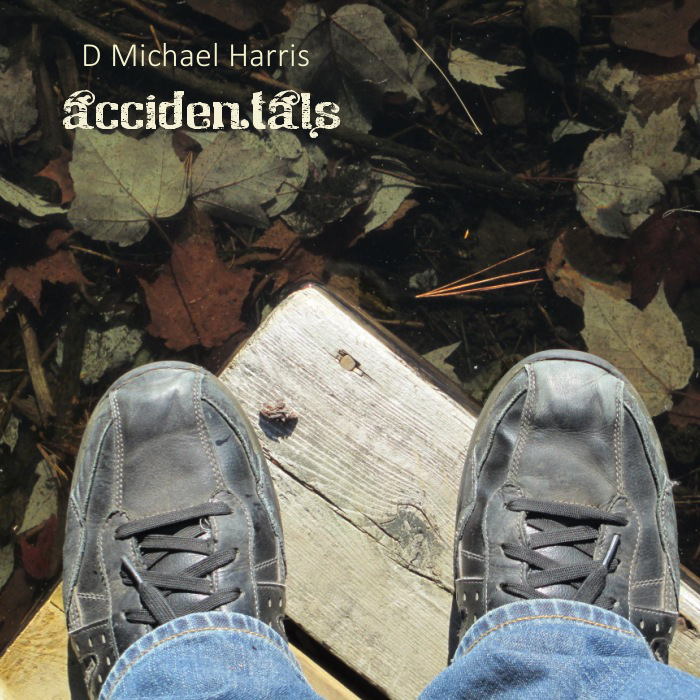 And before I knew it, my newly-acquainted dental hygienist was sharing the story of her first marriage that didn’t make it, and why it failed—not sharing any details unbecoming a professional, to be sure, but certainly more than I was expecting. And then she described her new partner, and how different he was from her first. Between rinses I said something or other about her “new husband ” before propping my mouth open again for inspection. This might catch both of us off guard—Christian marriage is a kind of prophecy—so I’d hasten to explain. In the Bible, when the prophets want to talk about God’s love for his people, his faithfulness to them and his determination to stick with them through thick or thin—with them as a people, mind you, not as individuals—one of the regular images they use is of a husband’s faithful love for his wife. In Jeremiah it says it like this: “Return to me, says the Lord, for I am married to you..” In Isaiah it says it like this: “Your Maker is your husband, the Lord of Hosts is his name.” And, of course, the whole entire book of Hosea is built around this picture. The Lord is, spiritually speaking, betrothed to his people. In the Scriptures then, the exclusive, permanent, faithful covenant bond between husband and wife is actually a sort of prophetic object lesson for that final day. Prophetic, in that, whenever we glimpse a man and a woman sticking by each other for better or for worse, it points beyond itself, to God’s greater, higher, purer determination to stick by us for better or for worse. And prophetic too, in that, as imperfect and human as the marriage covenant is, it is still, at its best, a reminder of the coming consummation of all things, when the faithful in Christ will take their place in the Wedding Banquet of the Lamb, and God’s covenant love will reign beautifully and fully in every heart. In their daily, mundane, earthy growing together in covenant love, the married couple is actually, biblically, a prophetic couple, reminding us, even if incompletely, of what is (God’s covenant love) and what is yet to be (the consummation of all things in Christ). I’m not really sure what my dental hygienist would have said to all that, if I’d managed to squeeze it out between rinsings, but more and more these days I think Christian husbands and wives would do well to regain the prophetic aspect of a godly marriage, and with it a conscious awareness that their life together can, at its best, bear witness to something true about God’s heart for us. 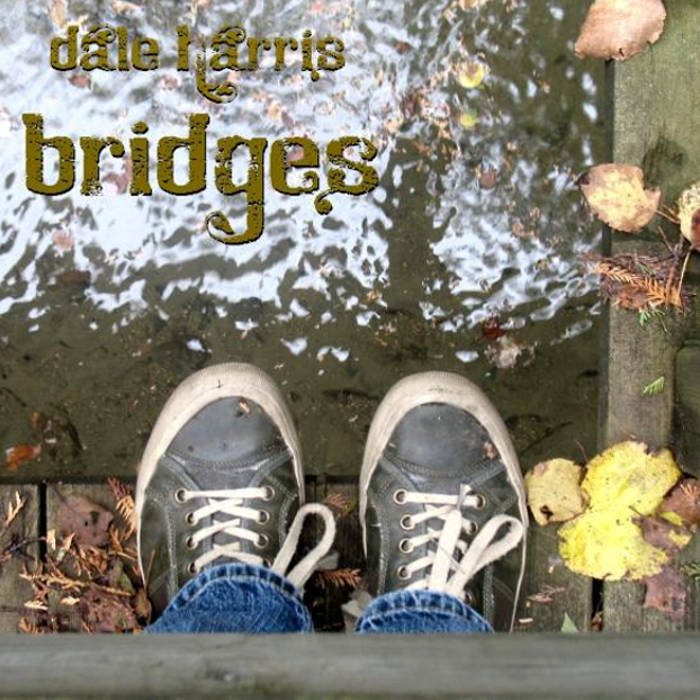 If we did, I think we would not only find deeper, more profound meaning in our daily decisions to make it work when making it work takes all we’ve got, but more than that, we’d find ourselves with a prophetic word to speak to the broader culture. Because this is about a different way of being as much as it is about a different perspective on marriage; it's about being "us" centred and focused on the "yet to come," in a world that is increasingly self-centred and focused on the instant gratification of the here and now. Jesus said: “The Kingdom of Heaven is like a treasure hidden in a field. When a man found it, he hid it again, and then in his joy went and sold all he had and bought that field. Once when I was a kid, maybe 10 or 11 years old, I was walking home from School one day in the middle of February. And it was cold, so I was all hunched up with my head down, which is probably why I spotted it. It was a bright, shiny quarter in the middle of the road. Now, I got to say, this was back in the days when a quarter was still worth something. I mean, they still had the penny back then, and a quarter was a whole entire 25 of them. The convenience store in town sold gummy-bears for a penny each, so, I mean: you do the math. That was a bag of 25 sweet, chewy gummy bears just waiting to be purchased, right? There was only one problem. Like I say, it was in the dead of February, and that quarter was frozen into the ice. This was in small town Alberta, so they didn’t salt the roads, and this street wasn’t used so much, so the ice was smooth and clear and hard, and you could just see that quarter there—all 25 cents worth of it—shining up at me. But I couldn’t get at it. Now, I hate to say it, but that quarter became the obsession of my little 10-year-old life, and every day for the next week, I’d go home by that road to check and see if the quarter was still there. And it always was. We were in the middle of a cold-spell. And it was always just out of reach. Until one day, there was a Chinook. A Chinook is a really warm wind that blows in from the Rockies right in the middle of winter, and the temperature can go from 20 degrees below to 5 above in a matter of hours. So you probably know what I was thinking about all afternoon at school, as the snow banks outside the classroom window kept melting and melting? That quarter. Cause I knew that come 3:30, I’d be on my way home, 25 cents richer than I was before. I was already imaging the 25 gooey gummy bears I was gonna buy with that 25-cent treasure. Maybe I wasn’t the only 10 year old that had his eye on it, but someone, apparently, beat me to it. I always think of that story whenever I read that parable about the buried treasure in Matthew. 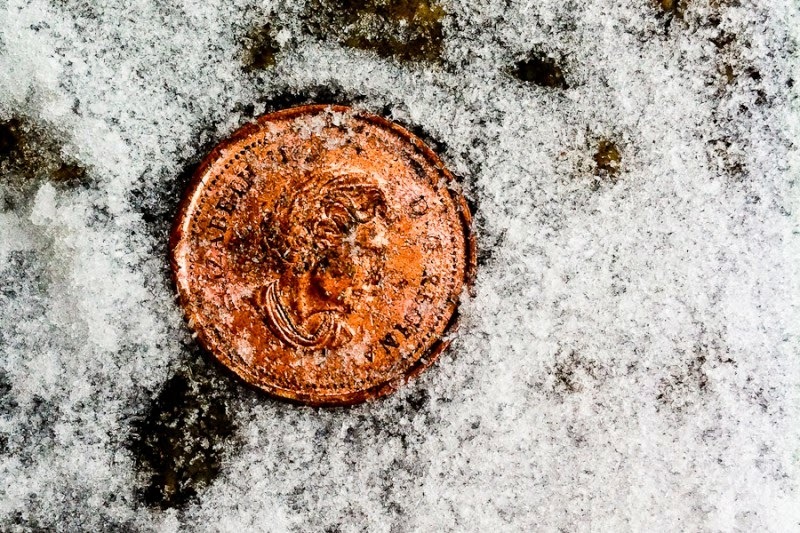 Because Jesus says that the Kingdom of Heaven—life with him as Lord, leading us and directing us and showing us how to live—Life with God in charge—is sort of like that quarter frozen in the ice. Of course, as a 10-year-old boy, I didn’t have much to my name that I could have sold. Even if I’d sold all my Lego sets and my video games, I’d still wouldn’t have had enough to buy that road with the frozen quarter in it. But that’s not really Jesus’ point, anyway. Jesus’ point is that life with him is worth everything, and whatever it takes to enter into life with him, and to hang on to life with him—it’s worth it. Like a treasure buried in a field, and once you know it’s there, you’ll do everything you can to get your hands on it. Or like a quarter, frozen in the ice, for a 10 year old kid; and once you know it’s there it starts to occupy your every waking moment because you want it so much. I’m saying this, partly because sometimes you can be following Jesus for a long, long time, and you can sort of forget how beautiful, how precious, how valuable a thing we have in him. I mean: the love and life and presence of God, his goodness and mercy following us all the days of our lives, the promise that we will dwell in the house of the Lord forever. Forget the retirement savings fund, what we may or may not have in the bank account, the 25-cent piece frozen in the road, if we’ve got that, we are rich beyond compare. But I’m also saying it because sometimes it’s tempting to wonder if life with Jesus really is worth it? I mean: life with Jesus as Lord sometimes means saying no to things we’d rather say yes to, or saying yes to things we’d rather say no to. It means making the effort when it would be easier not to. It means sacrifice sometimes, and hanging on to some things so we can let go of others. And sometimes you can sort of wonder: is it really worth it? Is he really worth it? And if that’s making sense to you, then I hope you’ll get it when I say that: Life with Jesus as Lord is worth everything. And on that day, when we stand with him in glory, and he rewards all the sacrifices and effort with a beautiful, loving, tender, “Well done, good and faithful servant.” On that day wel’ll know: whatever it took, it was worth it. A book cipher is a secret code that uses a literary text as the key for deciphering its message. You chose a text—say the Declaration of Independence, or Shapkespeare’s Macbeth—and then you give the letters in the secret message numbers that mark the location of matching letters in the key text. To decode the message, you take the numbers and look up the corresponding letters in the key text. Book-ciphers are especially powerful encryptions, because without knowing the “key text”—what book you used to encrypt your message—it’s pretty hard crack the code. The word “theology” is made up of two Greek words: the word for “God,” theos, and the word for “word,” logos. Just like biology is the study of “bios”—life—and anthropology is the study of “anthropos”—man— we might say that “theology” is the study of theos. God. Of course it’s relatively easy to study animals or humans—you can weigh and measure and observe them—but it’s a lot harder to study God in this way. Because if God is God, then whatever else is true about him, he’s beyond human comprehension, further and higher and greater and deeper than anything we could imagine. We might study our experience of God—how belief in God “makes us feel,” but when we’re studying these things, how do we know we’re actually doing theology—speaking about God—and not just doing psychology or anthropology or what have you? This is why theologians often talk about the need for “divine revelation.” Revelation comes from the word “to reveal,” and the idea is, the only way finite human beings like us could have true knowledge of an infinite God is if God revealed himself to us. We can’t study or reason our way to God; we need God to come to us. In the Christian Faith, this is especially important, because the problem is not just that God is infinite and we’re finite. The problem is that humans are fallen. Our reason, and imagination and intellect and so on—all the things we’d use to understand God—are distorted by selfishness and fear and pride. It’s like we’re trying to get a clear picture of God by looking through a cracked telescope. Because of this, Christian theologians make a careful distinction between two kinds of revelation. “General Revelation” is the stuff about God that we can learn and discern based on the world around us, and “Special Revelation” is the stuff God has revealed to us directly. We look at Creation, for instance, and see how huge it is, how intricately it’s designed, and so on, and we figure: whoever made this must be all-powerful and wise. Or we look in our own hearts and we find things like, a love of beauty, or a sense of right and wrong, and we figure: whoever made me must be beautiful and good. This kind of “general revelation” is available to everyone; but again, because the telescope is cracked, it can only get us so far. We need God’s Special Revelation if we’re to know him truly. Think of it as a beautiful, compelling “book-cipher,” where knowledge of God is the message, and try as we might, without the “key text”—Special Revelation, that is—we can’t fully or correctly decipher the message. So God gave us the key text. Jesus is the Key Text. But the book that shows us him—who he is, where he came from and why he came—the Bible, that is—if it’s read especially to know and follow Jesus—the Bible becomes the key-text for the key-text, enabling us to decipher the Truth about God. This explains why the Bible is such a central Book in the Christian life; but it also explains why Jesus said that we will only find Life in the Scriptures if we read them to discover Him. There’s a simple line in 2 Kings 8:21-29 that’s easy to breeze by, but should give us pause if we stop to notice it. It's describing the reign of king Joram of Judah, and in verse 23 it says, "all the stuff he did, are they not written in the book of the chronicles of the kings of Judah?" You actually see this a lot in 1 & 2 Kings. The author will mention a king, describe a few details about his reign (usually focusing on whether he did right in the eyes of YHWH or not) and then he'll say, basically, "If you want to find out the stuff he did, you can read a different history book." And like I say, it doesn’t look like such a big deal, unless you stop and ask why. Because it suggests to me that there are, in fact, two records of the days of our lives-- the record we keep ourselves, and the record that God keeps. In a way, when you read 1 & 2 Kings, you're reading God's own record of each king's reign; and if you want the world's record of how things went down, you'll have to look elsewhere. It's sort of a truism that "history is written by the winners," but as far as the author of 2 Kings is concerned, that's bunk. History, in fact, true history, is written by God, and he sifts all the winners and losers through a much different sieve than we do. And this is where it can, and should, give us pause. Because I know I keep my own "book of the chronicles of the kings of Judah"-- that is to say, I've got my own record of my life story. There are times I failed, and times I accomplished things. I have a list of stuff I've done and gone through that I'm pretty sure "matter," and a million things I've already forgotten about because they seemed so insignificant. Oh, the stories I could tell. And I don’t think I’m alone in this all-too-human impulse. But through 2 Kings 8:23, and all the other places in the Book of Kings where you come across that same refrain, God seems to be saying to us: “Listen. I will tell the true story of your life, in the end, and you may be surprised by all the plot twists you never noticed while you were living through them. The things you think are so important may only get a footnote, and the things you're embarrassed by or wish you could forget, they may turn out to be key elements of the story in the end. You just keep living it and let me write the history." May God grant us all the grace to just keep living it and let him tell the story of it, when it's all said and done. 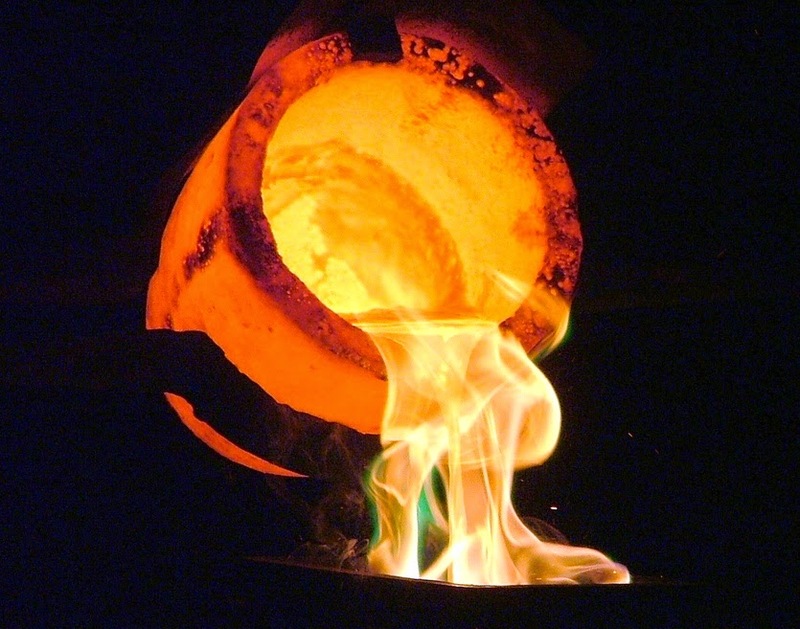 In metallurgy, a crucible is a heat-resistant container that’s used to melt down and purify metal—copper, iron, gold or what have you. It's made of material that can withstand the extreme heat necessary to melt whatever's placed in it. The metal melts, the impurities are burned off, and the crucible is left intact. Inasmuch as it is a vessel designed to withstand high temperatures so that its contents can be purified and/or transformed, the crucible is, I think, a powerful analogy for Christian marriage. For a Christian, marriage is meant to be a crucible for discipleship—a vessel, of sorts, designed to withstand extreme conditions, so that its contents—the man and woman who have covenanted together before God—can be purified and transformed as followers of Jesus. Let me get extremely concrete here. I remember one of the first “heated discussions” my wife and I had as newly-weds. She was expecting me home at a certain time, and I wasn’t going to be home then but didn’t call to let her know. She expressed to me her concern, and I (I confess) countered with indignation—I never had to “check in” with anyone before—and a while later we were cooling off and apologizing. This, on the surface, sounds like a pretty ho-hum, mundane thing, the kind of domestic “sorting-out-of-expectations” that every newly-wed couple needs to work through. Unless you’re working with the definition of discipleship that I’m working with: that being a disciple of Jesus is about being increasingly “Christ-centred” and “others-oriented,” so that the “self” makes room for Jesus, and he, once he’s at the centre, turns the heart out towards others. Sin, as Augustine said, is the self curved in on itself. Discipleship, I’d add, is about having that curve turned inside out. To the extent that I was learning to surrender the freedom I once had to come and go at whim without regard to how it might impact others; and to the further extent that I had no choice but to learn this, because the “vessel” that held my wife and I together wasn’t about to dissolve, just because the heat had turned up—to that extent—our argument over the call I’d neglected to make was, in fact, a profound discipleship moment. So are the disagreements about how to spend money, or how to parent the kids, or who ought to take care of the vacuuming, that every married couple will have in different ways at different times. None of these things, on the surface, seem like profound discipleship moments, but these domestic, day-to-day, ho-hum activities present us continually with the choice to keep the self as the axis of life, or to allow Jesus to be there and have him turn us out towards others. And perhaps it’s because these mundane, terribly “unsexy” things have such power to shape us spiritually, that they also happen to be the things that most often cause the most melt-downs in marriage: money, parenting styles, housework. The warp and woof of life together. As a crucible for discipleship, then, marriage is meant to shape us into “Christ-centred,” “others-oriented” men and women, because it holds us together when the heat heats up—the argument over the cost of that golf game, the spat over indulging the kids too much, the frustration over the unvacuumed floor, whatever it is—so that the impurities of selfishness can burn off and the gold of an "others-oriented life" can be refined. This particular crucible was especially designed to withstand the heat of the soul-smelting process. If it feels like I’m beating this metaphor to death, it’s only because, once you imagine marriage as a crucible for discipleship, some very important points come into focus that start to challenge some cultural assumptions about marriage, even assumptions held by the Christian sub-culture. For starters: marriage is not about me, or for me. Culturally, our view of marriage is increasingly self-centred. It’s about fulfilling the felt-needs of the individual and only worth working on so long as it does. I’ve blogged about this before, but the thing is: marriage is actually about Jesus and for Jesus. Of course, I’d argue that a marriage which genuinely brings glory to Jesus will be the most fulfilling kind of marriage, in the long run; but self-fulfillment, itself, isn’t the goal. Secondly (and here’s where the “crucible” image starts to speak to the Christian sub-culture): Marriage itself is not the highest ideal of the Christian life. It is, actually, a crucible for discipleship, not the crucible for discipleship. In fact, if you read the Scriptures closely (like in Matthew 19:10-12, or 1 Corinthians 7:8-31) it sort of looks like marriage is not even the best crucible. But that’s a blog post for another day. 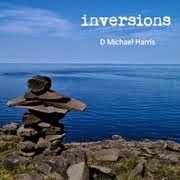 The point for today is just that: God’s goal is not, necessarily, “married Christians”; His goal is disciples. Marriage is a framework he provided for achieving that goal—a vital one, a beautiful one, a sacred one, an indispensable one—but not the only one. 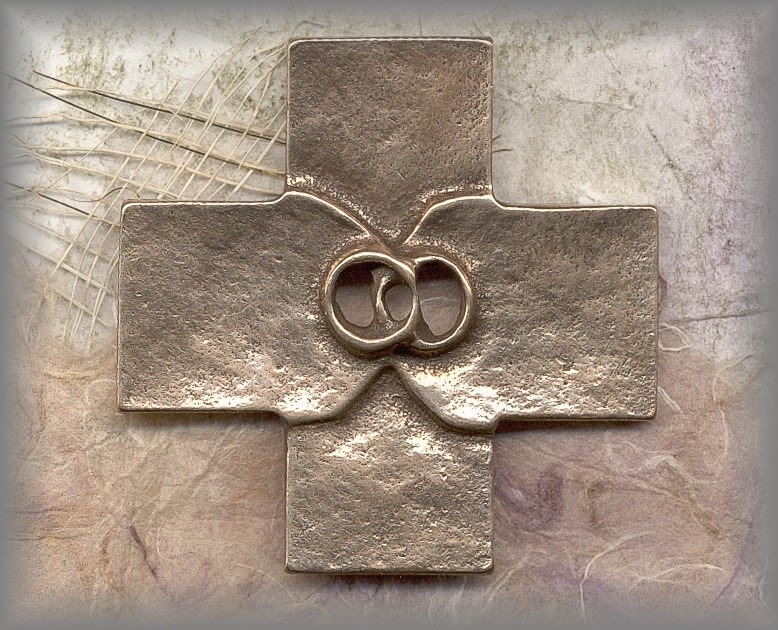 Sometimes churches, in their well-intentioned urgency to keep marriage vital and beautiful and sacred, can elevate it to a place the Bible never puts it, making it sort of the ideal expression of a Christian lifestyle. As a pastor, my concern is that, if we do this, a church can unintentionally marginalize the unmarried Christians in their community—the single Christian who for whatever reason never married, the divorced Christian who’s picking up the pieces, the widowed Christian in grief, the Christian who’s chosen the path of celibacy—telling them, in effect, that they are somehow or other “incomplete” in Christ because of their singleness. It is possible to put the family into such sharp focus that the other crucibles for discipleship that God has given us—celibacy, spiritual friendship, singleness lived out in the context of Christian community and so on—can blur out of focus, creating a sadly distorted depth of field. Viewing marriage as one among other crucibles for discipleship helps us bring the picture back into proper focus. I am a pastor, but I’m not naive. I realize that there are times when the crucible may be cracked irreparably, and there are other times when the heat that’s there is not at all purifying but only destructive. Marital abuse or spousal abandonment, for instance, is not a purifying fire, but a sign of something gone wrong deep down in the heart of things, and it needs to be addressed as such. But even in recognizing all that, I still see in this image—marriage as a crucible for discipleship—something compelling, and inspiring and worth the effort. If nothing else, it's challenging me to rethink my prayers when it comes to my marriage. Am I asking God simply to give me "a happy marriage"? Or am I asking him to make me a serious disciple of Jesus, and then giving him my roles as a husband, a father, my wife's best friend, to use in the process? Last week I had the opportunity to present a seminar for a network of Free Methodist pastors on the theology of social media. It was based on a research project I did for the FMCiC along the same lines. 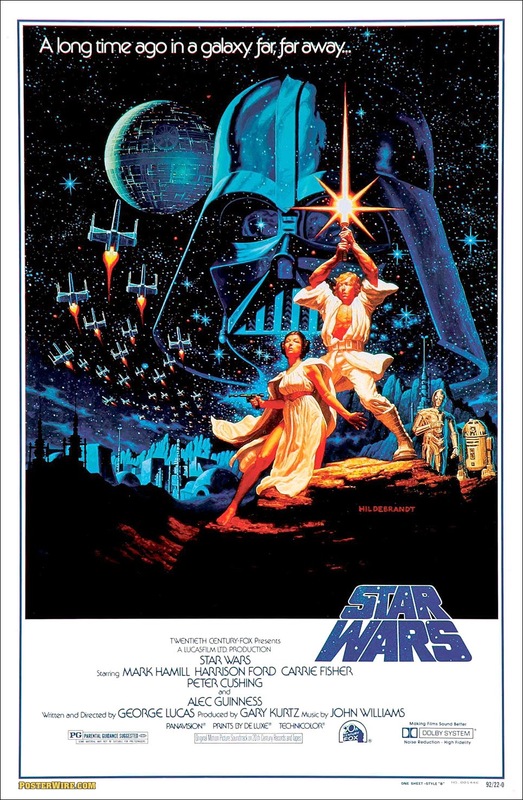 In case there was broader interest in this topic, I thought I'd post the seminar material here.